Tamsweg is the county town of a district of the same name and situated in the south-east of Salzburg. 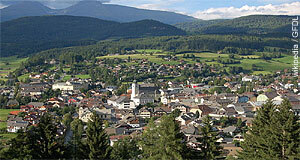 It has approximately 6,000 residents and as a county town, Tamsweg is the economic, administrative and educational centre of the Lungau area. Tamsweg also offers good opportunities for hiking or skiing holidays. In terms of sightseeing, note the Kirche St. Leonhard, a significant church of pilgrimage, and the parish church of St. Jakob. Train aficionados will enjoy the Murtal, a narrow gauge railway. For more on Tamsweg, we recommend a stroll through the town and a visit in the local town museum. Here you will have an opportunity to learn more about the history and sometimes peculiar culture of Tamsweg and the Lungau in general. The story of this most remote of Salzburg′s diverse valleys is quite interesting. Tamsweg itself will easily entertain you for a few hours if you plan your visit as stop-over. If you want to stay for longer, you might want to look into supplementary things to do beyond a walk through this neat historic town. For a hiking trip into the surroundings of Tamsweg, consult the local tourist information centre - it will be able to provide you with advice for trips that are appropriate for this particular season. One destination we warmly recommend is the Prebersee, a mountain lake that is famous in Austria for a rifle event: Once a year at the Preberseeschießen (Lake Preber Shooting), riflemen in traditional costume aim at the reflection of bull′s eyes on the water surface. Their bullets are deflected in the same angle and ideally, they hit the bull′s eye. This is done several times a year, but the one, big event is usually held in mid-June. Here again, the Tamsweg tourist information centre will provide up-to-date advice.